Deliciously decadent and so, so simple to send! Our gourmet Christmas hampers are Australia’s favourite choice in the busy, silly season. Say NO to shopping centres this Christmas, and hello to Australian Gourmet Gifts! Need corporate Christmas gift hampers delivered? We can help with one or thousands. We’re trusted to deliver corporate Christmas gift hampers by some of Australia’s biggest brands – and Hamper Orders over $1000 are discounted and still delivered 100% free Australia wide. 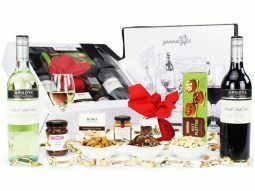 For loved ones, or clients you love, Australian Gourmet Gifts is the decadent and trusted choice for Christmas hampers in Australia. Delicately wrapped and packed full of premium products designed to impress the receiver, our Christmas hampers are the perfect gift! Choose from our wide selection of Christmas gift baskets that contain something for everyone, from Sparkling Wine & Champagne hampers, to indulging Gourmet Food Hampers that will delight both the chocolate lover and the discerning foodie. Ranging from great value to extravagant luxury, you can select the Christmas hamper that best suits your needs and you can guarantee that it will be filled with an amazing selection of tasty goodies. Send friends and family a luxury gourmet food and wine gift hamper this Christmas. Beautifully packaged with a personal card from you, they’re the perfect way to celebrate Christmas. Can’t be with your family in Sydney this year? Send a Christmas basket for the whole family to share at Christmas lunch. Our hampers make very special Christmas food gifts that show your loved ones that you care. Looking to get something special for Dad in Melbourne? Choose one of our premium Gift Hampers for Men to make his day. We have great Xmas Gift Hamper options for everyone! 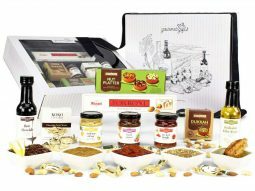 Australia’s biggest brands trust Australian Gourmet Gifts to deliver show-stopping corporate Christmas hampers to their clients and staff. Delivering your clients special, personalised Christmas wishes will take your team hours and hours of preparation. That’s where we come in. We take away the Christmas stress by picking, packing and delivering only 100% premium quality Christmas Gourmet Food Hampers across Australia. No matter how many Christmas hampers you need, we’ve got you covered; in fact, we might even offer you a discount! We are the only Gift Hamper Company in Australia to offer a 10% Discount on all orders above $1,000.00 across our entire range, including all Christmas Hampers. We understand that sticking to your corporate budget is important. We have a beautiful selection of Christmas hampers under $100 which will make a great impression to your clients and employees. In addition, all our Christmas Hampers come with free delivery Australia wide, whether Melbourne, Sydney, Perth or anywhere in between. Australian Gourmet gifts for Christmas make a guaranteed good impression. Think of us as the online elves protecting your brand’s reputation! That’s what Australian Gourmet Gifts is all about. Our wide variety of Christmas hampers means that there are Christmas gifts for everyone – whether you’re looking for the best value hampers that deliver some serious bang for your buck, or luxury gift baskets that need to impress. Some focus on food, others on wine, and others on indulgent gourmet goodies. For the ones that love all-round entertaining, our very popular Wine & Beer Hampers are just perfect! One of the best things about Christmas is that it provides an excuse to get together with family, friends and loved ones and indulge in some serious banqueting. As proud and passionate foodies, we’ve put together a gorgeous collection of Christmas food hampers brimming over with delicious goodies – from traditional nougat, to artisanal biscuits, to gourmet Christmas puddings. In fact, it’s safe to say there’s something for everyone, whether you’re looking for a way to spoil your family or you’re considering boosting goodwill in your company with Australian food Christmas hampers for clients and staff. Our Christmas wine hampers provide premium wines at far more reasonable prices than you would usually expect to pay. One of the secrets to the success of our collection is that the wines selected are those sold at some of Australia’s finest restaurants. Consequently, our luxury wine Christmas hampers are definitely designed for those who enjoy a top shelf drop (or two). You can expect high-end brands, from Penfolds Bin 389 “Baby Grange” to Moet Champagne. To match such luxurious wines, we have handpicked a selection of gourmet Christmas products, such as a traditional boiled Christmas pudding, a delectable Butterscotch & Brandy Sauce, and divine Australian chocolate.